Looking to save hundreds, or maybe even thousands of dollars a year on soda costs? Then fox’s bag in a box soda and beverage syrups are just what you need. These 5 gallon boxes hold up to 640 7oz. servings and with their great low price, fox’s sodas can save you thousands of dollars per year in your beverage costs. Use these 5 gallon bag in a box beverage syrups with your existing soda dispensing machines, which is an excellent value compared to national brands! Why does Fox’s cost less? While branded product manufacturers spend millions of dollars on advertising, Fox manufactures and distributes directly to wholesalers who pass the discounts on to the end user. These products are ideal for anyone who wants to save money and is not trying to drive beverage sales by "name brand only". Here is a quick video that shows you how easy it is to change your coke or pepsi dispensing machine into a fox’s soda dispensing machine. And don’t forget to check out our fox’s bag in a box servings and savings calculator on our food service resources page. 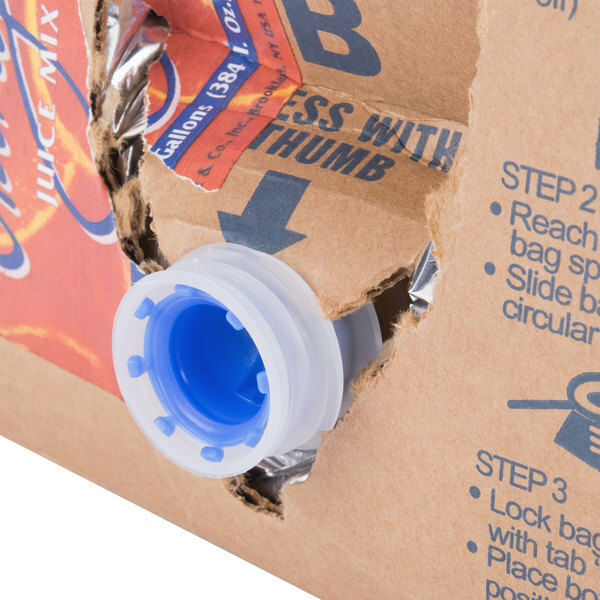 Save money by converting your soda fountain to use Fox's bag in box drinks! 1.Remove the nozzle on the old box. 2. Recycle the old box. 3. Press in with your thumb on circle "A." 4. Lift flap "B," but do not tear off. 5. Slide the bag spout into hole "A." 6. Lock the spout into place with tab "B." 7. Place the new box on the shelf. 9. Slide the nozzle back onto the spout. 10. Snap the nozzle into place, making sure to align it with the "in" arrow. 11. Enjoy ice cold bag in box drinks! Follow these easy steps to quickly swap out your bag in box drinks! Looking for essential items to include with your hotel's breakfast service? 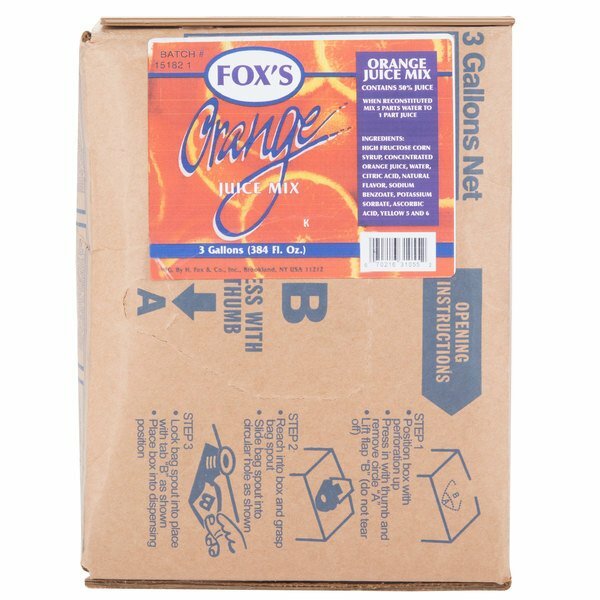 Fox's bag in box orange juice syrup makes it easy to refill your soda or beverage dispenser and always have orange juice beverages on hand! A corporation specializing in irresistible ice cream toppings, sweet syrups, and fizzy soda mixes for over 100 years, H. Fox & Company takes great pride in their products. The sweet citrus flavor of oranges complements many other fruits and is filled with Vitamin C to keep your patrons feeling refreshed. 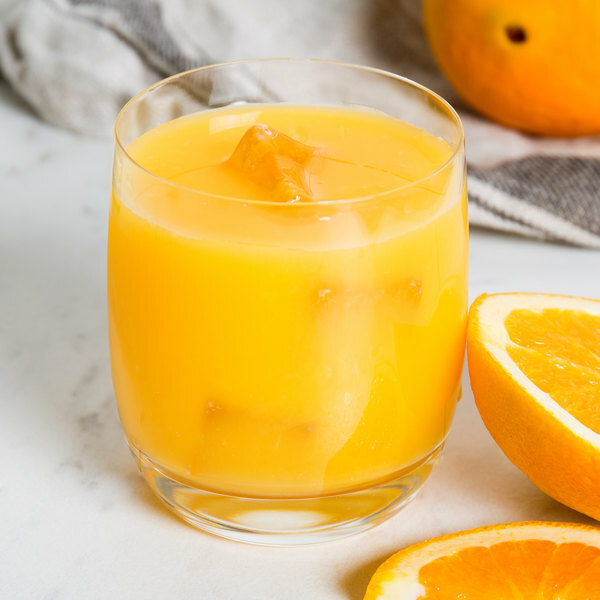 Great for your hotel, resort, cafe, or bar, this cool and tangy orange juice satisfies patrons all throughout the day-from a breakfast drink to an evening cocktail! 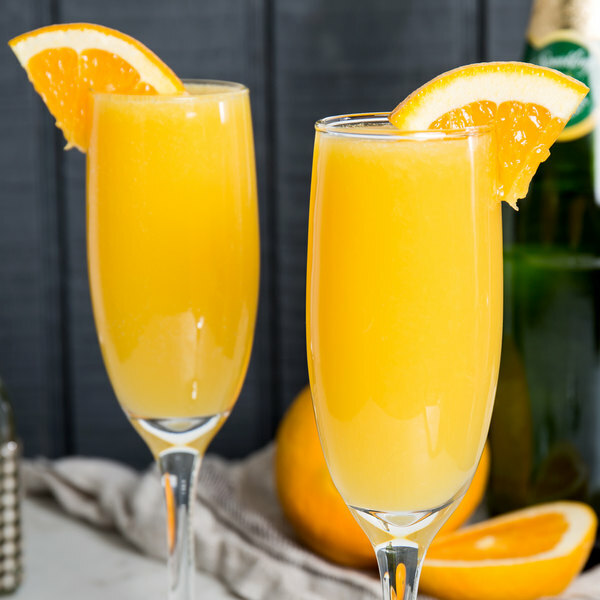 The 3 gallon supply of orange juice is ideal for creating many popular mimosa drinks. Mix orange juice and vodka to create a classic screwdriver, or use orange juice for an endless number of fruity cocktails. 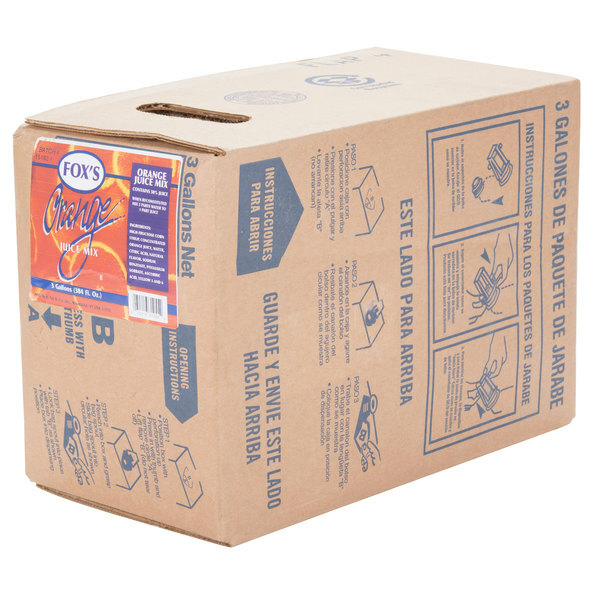 Fox's bag and box are recyclable, and this orange juice syrup reduces waste by dispensing only the desired amount to mix a 3% juice drink. 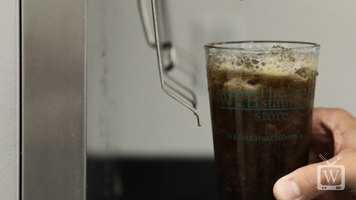 Simply add 1 part syrup to 5 parts carbonated water. 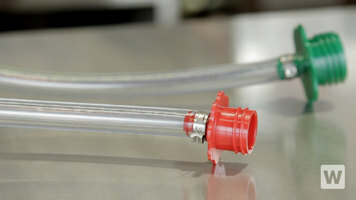 Fox syrups are interchangeable with other beverage products; an adapter is needed to use this product with some machines. This item is certified Kosher by Kay Kosher Supervision. The price for Fox'x bag in a box juice is just too good to pass up. The quality of the orange juice is superb and if you didnt know you would like its fresh squeezed. Decent quality as a mixer, definitely not going to mistake it for fresh squeezed juice but better than a few other bag in box oj I have tried. Fox's Bag in Box Orange Juice Syrup - 3 Gallon I am a syrup hog and its hard to find decent orange juice in syrup for a b d this one actually taste a lot like real OJ. whoda thunk it? Save Up To $5.20 with our Recommended Product! With the same great flavor as the H. Fox version, this Narvon bag-in-box syrup gives you the taste you want, at the price you need. Plus this item is eligible for free shipping! 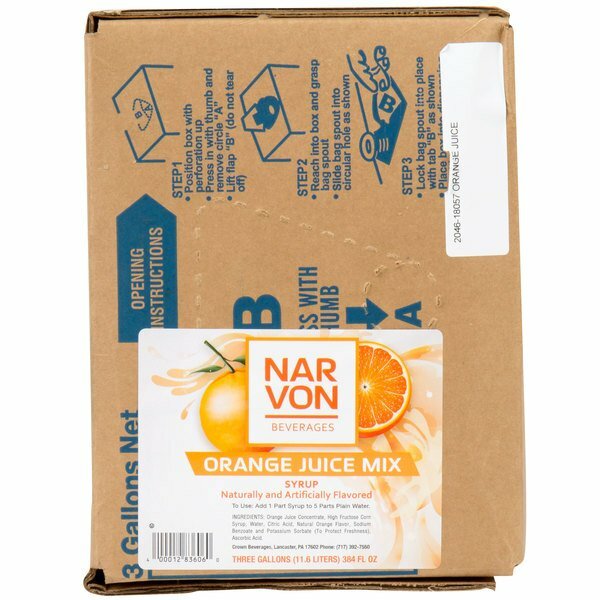 This Narvon bag-in-box syrup makes it easy to refill your soda dispensers for continued service. It's a great alternative to big brand syrups, and it even works in those machines. Use this syrup at your movie theatre, bar, hotel, diner, fast food operation, pizza shop, sandwich shop, or take out station! Anywhere you'd use the H. Fox syrup, use Narvon instead!